If you're looking to skip the airport transfer bus then this Birmingham Airport car park is for you. Conveniently located, you're just a three-minute stroll from the terminal building - meaning you can grab your bags and go. Perfect if you're flying off for a weekend break or shorter trip. No transfers required with this conveniently located car park. Holder of the Park Mark Safer Parking Award, this car park also features: CCTV cameras, high perimeter fencing and regular security patrols. Bays for Blue Badge holders are provided, but not guaranteed, please ask staff via intercom on arrival. 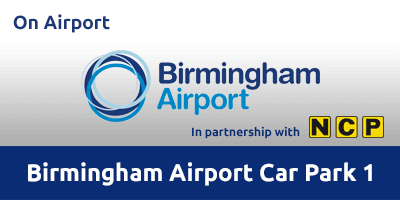 This Birmingham Airport car park is open 365 days a year, 24 hours a day. On arrival to the airport, follow signs for Car Park 1. Do not press for a ticket, should a ticket not be automatically issued for you, please press the call button for assistance. Collect your car from where you previously parked it. Drive to the exit barrier and insert the ticket you were issued on arrival. The barrier will rise and you can continue with your journey.